A friend of mine named Gene used to fly Cobras — attack helicopters used by the United States Marine Corps. While he was flying Hueys (another prestigious helicopter used by the US Army) during the Vietnam War, he was shot through the calf and the knee and spent nine months in the hospital. After this happened, he began training other pilots. My wife, Tanja, and me ready for the ride of a lifetime. I had the privilege of meeting him down in Phoenix, Arizona and taking a Cobra helicopter ride. The Arizona Commemorative Air Force Museum in Phoenix restores historic warplanes. 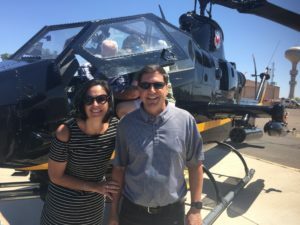 The museum is a must-see if you like aviation, and they have a Huey and Cobra that you can pay to ride in. The ride was 15 minutes long. We got to simulate an attack mission and help our soldiers on the ground. As you can imagine, the way that helicopter handles is quite impressive. We experienced G-force, which was fun. What a great adventure this life is, getting to try such things! The Cobra ride was awesome, but the best part of the whole trip was going to dinner with Gene and his buddy, Dave, who also flew in Vietnam. It is rare you get to hear stories about what it was like for them, and others, in that war. I learned so much that night just by listening to them reminisce and answer my dozens of questions. It is hard to find people who will talk about their combat experiences. I’m grateful to them for sharing and, as always, I am so appreciative of the men and women who serve our country.